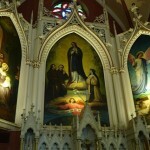 In 1859 Johann Schmitt painted the murals inside the Church of the Immaculata in Mt. Adams. 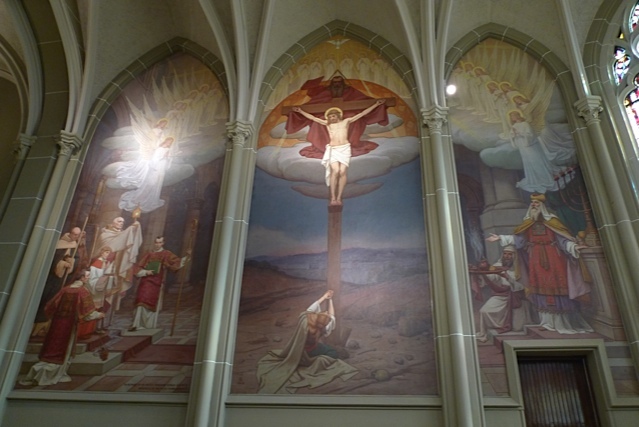 Fifty years later, in 1909, Frank Duvenek painted his 3 murals in St. Mary’s Cathedral Basilica of the Assumption in Covington. Duvenek was a student of Schmitt’s. 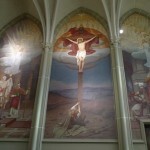 These 2 distinct sets of religious murals are well worth visiting, no matter your religion or lack thereof. I started with a visit to the Basilica in Covington. If you haven’t been, the Basilica is worth seeing not just for the Duveneks, but for the eye-popping stained glass windows—they rival those of any church anywhere. 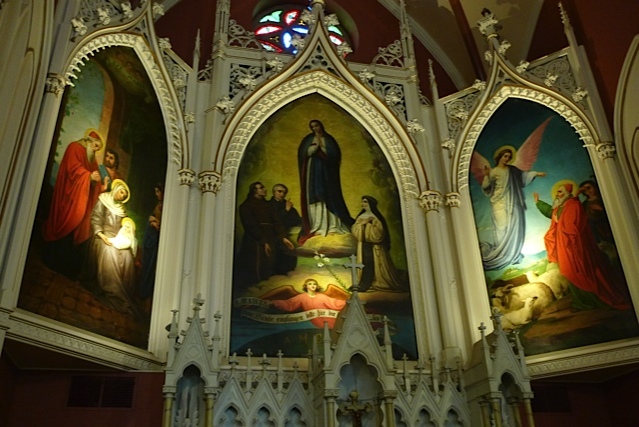 The Duvenek murals are located in the small but picturesque Blessed Sacrament Chapel. They are gothic in shape, arched to a point. 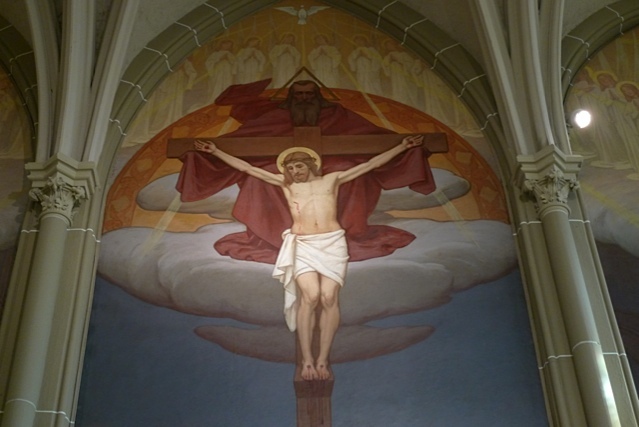 The central panel depicts Christ’s crucifixion. 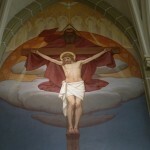 A bearded, cloaked God holds up the arms of the cross, as if to buoy Jesus in his suffering. Angels encircle God. At the base of the cross, Mary Magdala kneels, alone amidst a brown, desolate landscape strewn with skulls and bones, her hands clasped in prayer and reaching upward. The walled city and blue sky fill the background. At ground level, the painting is almost surreal, with the skulls and Mary Magdala’s flowing robes. It is an impressive religious painting. Two other panels flank this central scene. A Jewish priest (sic) prays in a temple in one. In the other, a Catholic priest, attended by servers, appears to be blessing his congregation. A ring of angels arcs from above and passes through all 3 panels. It is a quick drive back across the bridge and up the hill to the Church of the Immaculata, hovering over the hillside of Mt. Adams. Inside, on this weekday afternoon, it is dead quiet, the only noise from the occasional radiator clang. Alone, I am able to spend a little time absorbing the 7 Johann Schmitt panels. The theme here is entirely different: not death, but, instead life, the immaculate conception, birth and Mary’s ascension into heaven. It’s almost cheery compared to the somber, death centered image Duvenek worked. 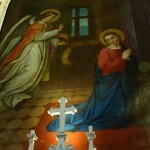 Schmitt’s murals are more colorful, the robes and fabrics in vivid reds and blues, the halos bright yellow. 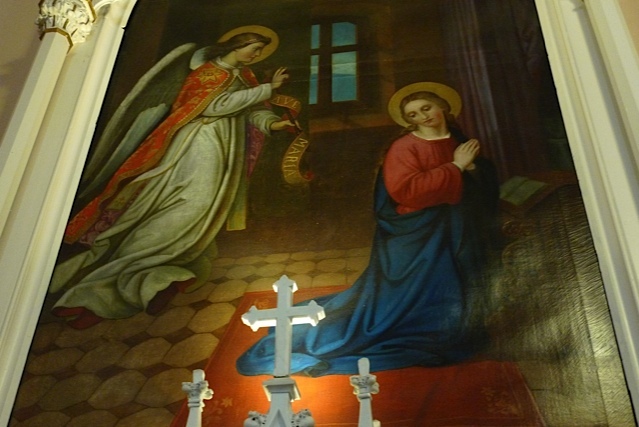 The seven murals depict the religious odyssey of Mary, from the visit by the angel notifying her of the immaculate conception to her ascension into heaven. The Immaculata murals are a bit lower, and one can get a better viewing vantage point than with Duvenek’s large murals that fill a wall of a smaller chapel within the Basilica. But, it seems to me that Schmitt’s faces are more detailed, more dimensional, his fabric more lavishly rendered. Duveneck is working at a disadvantage—namely the gloominess of the subject and his faces seem a bit flatter, the fabrics less detailed and perhaps less brilliant. In this head to head battle of teacher and student and their very different religious murals, I lean toward the teacher, Johann Schmitt, but by a bristle at most.